The chain of over 250 islands, located 650 km (528mi) to the southwest of the Philippines, make up Palau, a scuba diver’s dream. The water is warm year around, the islands are sparsely populated and the marine wildlife is abundant. 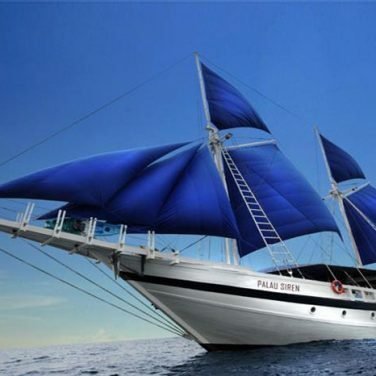 If you are a serious diver, a Palau liveaboard trip is probably on your list already. A combination of big groups of fish, manta rays, sharks, WWII wrecks and the famous Jellyfish Lake make Palau an terrific diving destination. Diving in Palau requires a budget for it. Due to its remoteness, the bill will start to add up quick. The islands are far and the logistics are not easy. 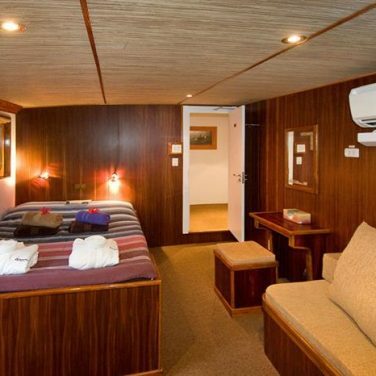 However, there are some great liveaboard options depending on your preferences and budget. To help you out when choosing a boat for your liveaboard vacation to Palau, we’ve put together this quick guide that highlights the best boats and also gives you some things to consider when it comes time to book. 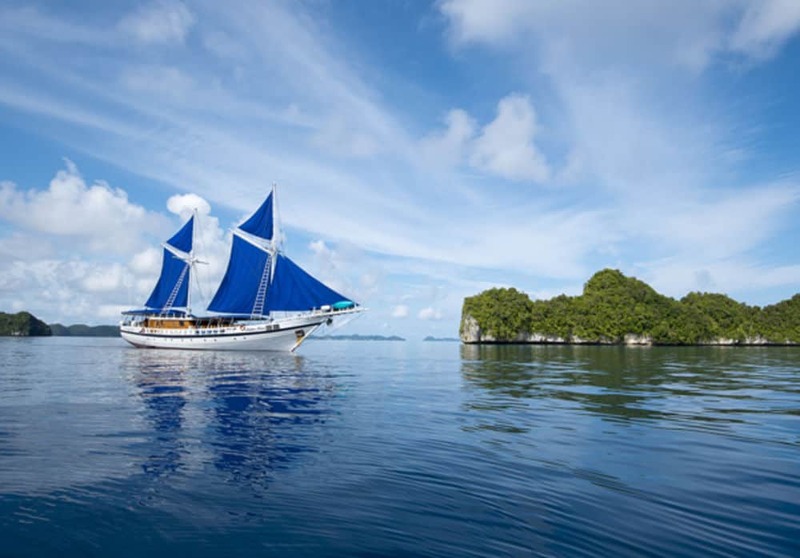 For divers who want to get away from it all, The Palau Siren’s 11 day expedition is a top pick. This itinerary stops at the region’s best sites, plus a few in the far north that no other liveaboards visit. And, if your focus is on wildlife, you’re in luck. 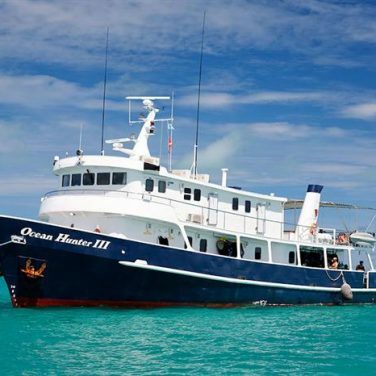 This boat also offers unique voyages focused on coral spawning, blackwater diving, and reef fish aggregations. Best of all, the Palau Siren provides plenty of perks for experienced guests. Modern camera facilities, free Nitrox, and specialty courses will keep veteran liveaboard divers comfortable. With a variety of itineraries and up to 5 dives a day, photographers have plenty of opportunities to capture their most exciting moments underwater aboard the Palau Aggressor II. This liveaboard also features the region’s best facilities for camera equipment. Separate rinse bins, a spacious table with blow dryers, and an indoor workstation make it easy to care for sensitive gear. And, photo pros are available onboard for coaching and help. Or, if you prefer, they can take the photos for you. 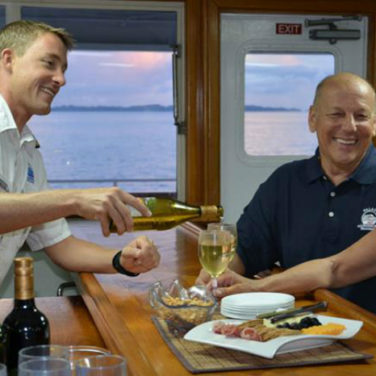 Like the rest of the Aggressor Fleet, this boat offers plenty of luxuries like fine dining, and complimentary beer and wine. 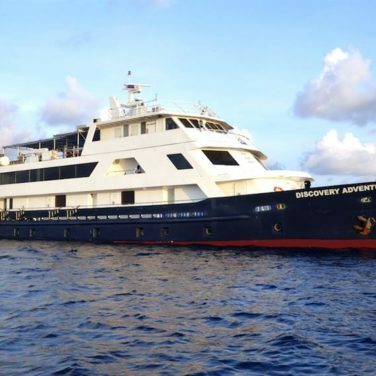 Palau isn’t a budget destination, but thrifty divers can still enjoy the trip of a lifetime aboard the Discovery Adventure. This boat is this region’s most affordable option, but don’t worry. You’ll still get outstanding service and amenities. 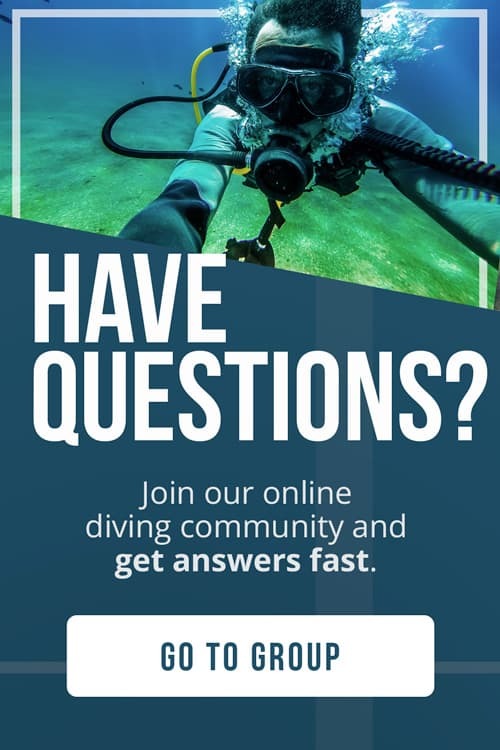 Four tanks a day, high-quality equipment for rent, and a variety of courses onboard make this a good value for those who just want to dive. 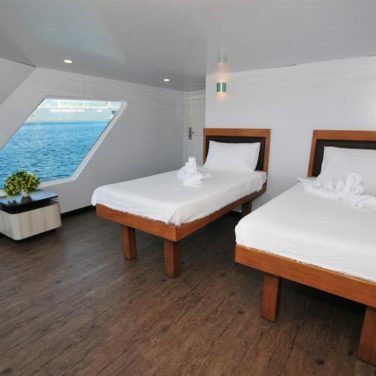 And, guests can expect plenty of relaxation between dives. 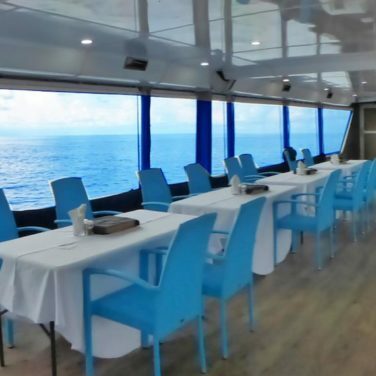 Delicious buffet dining throughout the day, spacious cabins and common areas, and a well-reviewed crew make this liveaboard a top pick. 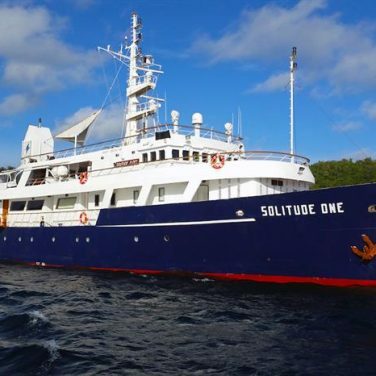 Experienced divers can take their trip to the next level onboard the Solitude One. 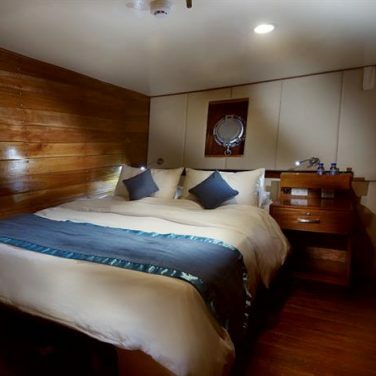 Tech and sidemount friendly facilities, the region’s most spacious dive deck, and an incredible indoor camera room will impress even the most seasoned liveaboard guests. 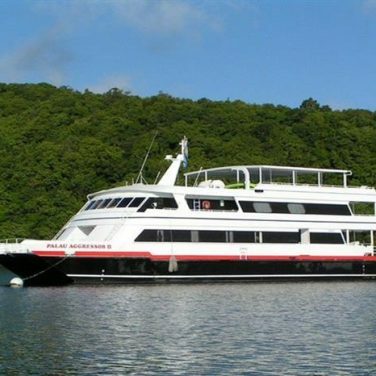 And, this is the only boat cruising in Palau that promises a maximum of 6 divers per guide. This boat offers plenty of creature comforts, too. Even the shared quad cabin is spacious and comfortable! Highly rated food, fluffy bathrobes, massage service, an on-deck jacuzzi, and a plush lounge make it easy to unwind between tanks. 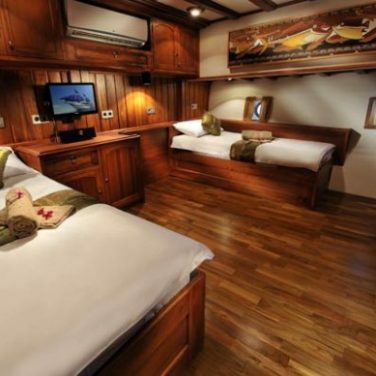 No matter what kind of liveaboard experience you’re after, the Ocean Hunter 3 is a good fit. 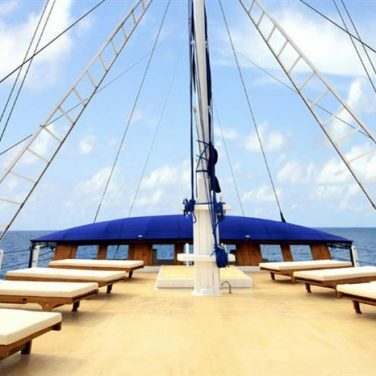 Experienced divers and photographers will appreciate extended itineraries and outstanding facilities for equipment. This includes camera rinse, photo station, and individual gear storage. 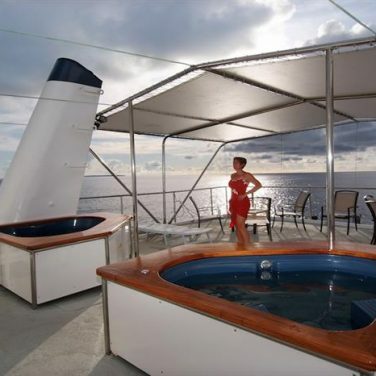 Non-divers can enjoy plenty of onboard entertainment with jacuzzis, kayaking, and internet access. Spacious cabins and common areas, top-rated food, and a full bar will keep even the most spoiled divers comfortable. And, a variety of price points make this boat accessible to divers of all budgets. Advanced. 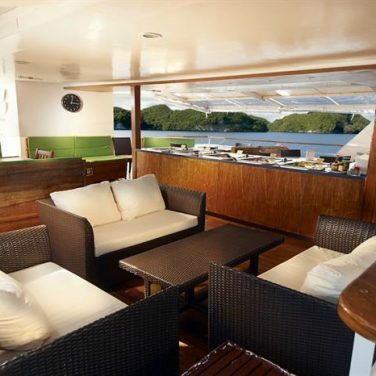 Palau is one of the world’s most exciting liveaboard destinations. But, it’s not for beginners. Divers in this region should be comfortable with unpredictable surface conditions and powerful currents. Experience making a negative descent and using a reef hook is necessary, too. 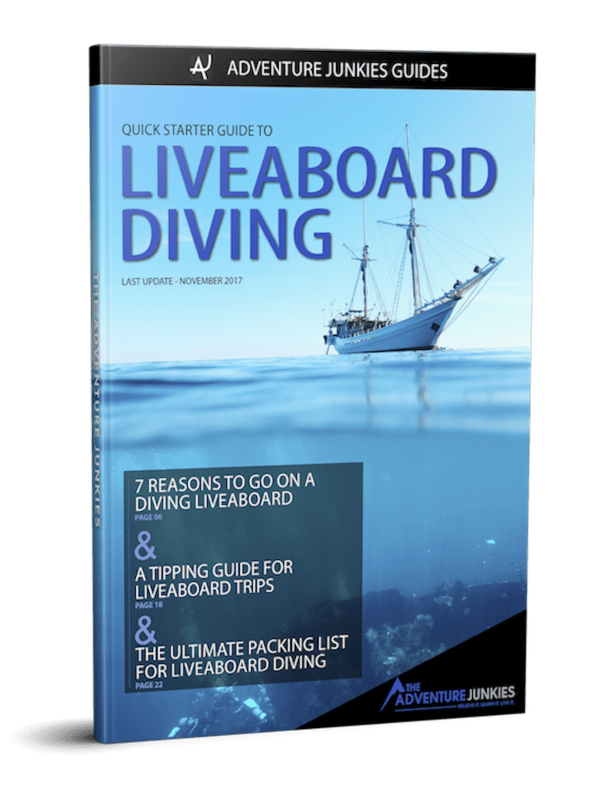 Most boats require advanced certification and at least 50 logged dives to join their itineraries. 8 to 11 days. Traditional itineraries in Palau spend 8 days exploring the archipelago and are an excellent introduction to the region. But, there’s no such thing as too much time underwater here. If you have time to spare, consider an extended voyage. Longer trips allow for multiple tanks at the very best sites, and a chance to dive in more remote areas. Palau is a year-round dive destination with several distinct seasons. If spotting supersized wildlife like whale sharks and manta rays is your top priority, plan a visit between January and March. Turtle enthusiasts may prefer summer months when green and hawksbill sightings peak. And, if your vacation falls between June and December, keep an eye on the weather. Typhoons do strike here. The weather in Palau is hot and humid all year, but plan for wind and rain during typhoon season. Ocean temperatures range from 71 to 86° F (22 to 30° C) with the coldest conditions from January to March. No matter what time of year you visit, a full wetsuit is best. You’ll need the extra protection from chilly thermoclines, hydroids, and jellyfish. Despite Palau’s nutrient-rich water and powerful currents, visibility around the archipelago is excellent. During typhoon season, wind and rain may leave dive sites murky on the surface. But, clarity typically remains good at depth, 49 to 131 feet (15 to 40 meters). Blooming plankton clouds the water between January and March, but it also attracts manta rays and whale sharks to feed. 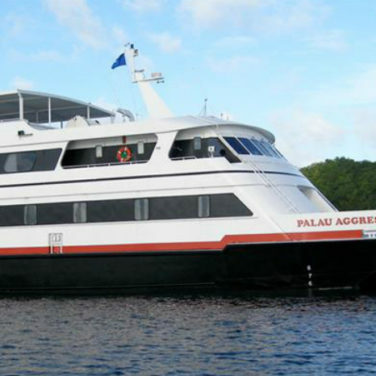 Divers in the know regard Palau as one of the world’s best liveaboard destinations. Visitors in this remote archipelago can expect healthy reefs teeming with unique wildlife like the iconic Palau Nautilus. You’ll likely see sharks on every dive, and have up close encounters with ocean giants like whale sharks and manta rays, too. 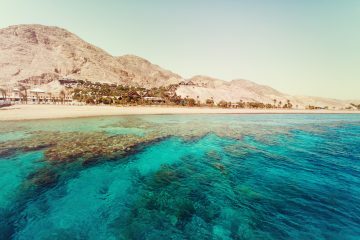 As if that isn’t reason enough to visit, the region is home to well preserved WWII wrecks, plummeting walls, and some of the South Pacific’s best drift diving. In 2009, Palau became the world’s first shark sanctuary. Since then, these graceful apex predators have made a significant comeback. Tigers, bulls, hammerheads, and other rare species are thriving. All that extra protection has paid off for the rest of the marine ecosystem, as well. Reduced fishing and stricter regulations are allowing the region’s fish and coral to flourish. You’ll want to spend as much time as possible underwater here. But, don’t miss out on the archipelago’s famous above water attractions. “Must see” additions to every liveaboard itinerary include a speedboat trip through the Rock Islands, a trip to the stingless jellyfish lake, and a mud bath at the Milky Way lagoon. Thanks to a convergence of ocean currents, Palau is right in the path of migrating pelagic species. Whale sharks don’t gather here in groups but frequently pass through the region in search of plankton, especially during spring months. No matter when you visit, keep a watchful eye out in the blue. The sharks feed in shallow water and are most often encountered during safety stops. Palau is one of the planet’s best places to dive with hammerhead sharks thanks to the region’s strict environmental protection. The sharks venture up from the deep close to dawn, so your best chances for an encounter are on early morning dives. But, keep an eye on the reef’s edge at all times. You never know when one might glide by! Manta rays frequent these waters year round, but your best chances for spotting them are during spring months. Between January and March, the rays gather here in large groups to breed and feast on plankton. Underwater photographers should plan some extra time around the region’s cleaning stations where the mantas are easiest to photograph. 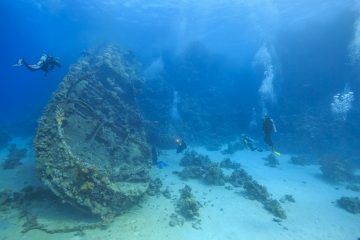 No trip to Palau is complete without a visit to the region’s famous WWII wrecks. These sunken vessels remain treasure troves of historical artifacts, protected from salvage. Encrusted with colorful coral, the ships are excellent sites for underwater photography, too. Remember that you should never enter or penetrate a shipwreck unless you are trained and certified to do so. Palau is a dream liveaboard destination, but many of its most famous sites aren’t for the faint of heart. You can expect strong currents throughout the region, perfect for thrill seekers and adrenaline junkies. Skills like negative entries and using a reef hook will come in handy, too. Most boats require advanced certification, and at least 50 logged dives. Palau is one of the planet’s best dive destinations, and well worth every minute underwater. But, traveling to this remote region takes time and effort. You can expect several days in transit each way. So, quick trips aren’t a practical option. Traditional itineraries in the archipelago last for 7 to 8 days and visit the best of Palau’s above and below water. These voyages are perfect for getting acquainted with the region, but leave some scuba divers wanting more. Keep in mind that you’ll only get 2 or 3 tanks in on the first and last days of your liveaboard, especially if you are flying right after the expedition ends. With multiple shore excursions included in every trip, you are sure to have some dry afternoons, too. Extended voyages around Palau are the best option for visitors with time on their hands. These trips visit all the same sites as classic 8 day itineraries but spend more time at each one. And, a flexible schedule allows these expeditions to follow the region’s famous wildlife. Sometimes you just need one more tank in stunning places like blue corner; especially during manta season. Longer itineraries may dive extra shipwrecks or venture off the beaten path to Palau’s far north for frontier diving, too. This is one of Palau’s most famous dive areas and a favorite stop for every liveaboard in the region. Expect a fascinating underwater landscape, full throttle currents, and plenty of pelagic action. Snappers, jacks, and triggerfish school by the hundreds here, attracting oceanic predators of all types. Tuna, wahoo, trevallies, and reef sharks are the most common. But, lucky groups can spot sailfish, hammerheads, dolphins, and even whales. 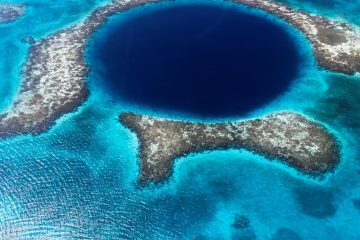 The nearby blue holes can only be explored in depth by tech and cave divers. But, there is plenty to see in and around the openings of this system of caverns. This iconic site is named for the channel cut through the reef by occupying German forces during World War II. Tidal movements funnel massive amounts of water through the channel, inviting large pelagics in from the open ocean. The most famous of these visitors are manta rays. If you’re hoping to dive alongside large numbers of these graceful filter feeders, plan your visit between January and March. During these months, the rays visit this region to mate. But, this site has plenty to offer besides mantas. Reef sharks, whale sharks, and hammerheads are frequent guests here, and the shallows are home to a wide variety of macro life. If your dive plan in Palau includes strong currents big sharks, the sites around Peleliu won’t disappoint. But, this area isn’t for beginners. Even experienced divers may find the conditions quite challenging thanks to a negative descent and high-speed drift. The best way to experience Peleliu’s pelagic action is by using a reef hook to hover in place. Then, wait patiently for the region’s most exciting wildlife to pass by. You’ll spot countless sharks on every immersion here, but keep watch in the blue for marine mammals like dolphins, sperm whales, and killer whales. Every liveaboard in Palau dives the Ulong channel. This shallow site is unique to the archipelago, with a sandy bottom and scattered coral gardens. Depending on the current, you might experience this site as a fast-paced drift. Or, you might use a reef hook to hang around and wait. Either way, you’re sure to see large groups of patrolling reef sharks. This is also a prime location for spawning reef fish between April and July. If you’ve had your fill of Palau’s pelagics, this is also one of the region’s best places to search for macro. Bommies here are home to nudibranchs, seahorses, frogfish, and leaf scorpionfish. Named for its dramatic stalactites and stalagmites, this site is actually a chain of five separate connecting caves. As you make your way further into the darkness, you’ll have a chance to observe the halocline. This layered effect is created by the meeting of salt and fresh water. If you don’t feel comfortable entering the cave, there is plenty to see just outside. WWII artifacts litter the seabed. And, late afternoon dives reveal large colonies of Mandarin Fish. If you’re hoping to spot these colorful dragonets, you’ll need to visit the site right before sundown. Palau’s most popular dive sites lie on the southwest side of Babeldaob. But, the northern reaches of this island are home to vast areas of uncharted coral reef. Only a few liveaboards visit this region, and only when weather permits. So, just a handful of privileged divers per year get to experience Palau’s best frontier dive sites. If you are fortunate enough to dive these unexplored waters, plan for nonstop pelagic action. Mantas, whale sharks, hammerheads, and reef sharks are the stars of the show. But, these remote sites are known for big shark sightings, too. Tigers, Silver-tips, and bulls are among the most exciting species spotted here.